Diamond is a very rare white Yorkie. He’s super tiny and has short Teddybear face. He’s got silky white coat. He’s tiny only weighs 1lb at 8 weeks estimated at 3lbs fully grown. He’s already putty trained on wee wee pads. He come with health certificate , microchip and registration. 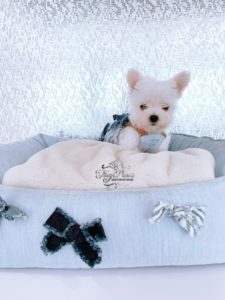 All our puppies come with health guarantee.